At least 86 persons have been confirmed killed by suspected herdsmen during an attack on Gashish district of Barkin Ladi Local Government Area of Plateau State. 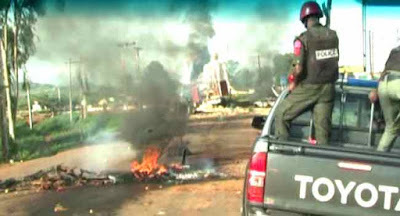 Police Public Relations Officer in the state, Mathias Tyopev, told Channels Television on Sunday that six people also were injured while at least 50 houses, two vehicles and 15 motorcycles were razed. The six villages attacked by the assailants are Xlands, Gindin Akwati, Ruku, Nhgar, Kura Falls and Kakuruk, all in Gashish. According to the command spokesman, the figure is an update of the initial 11 death toll he disclosed to the media. He said, “I want to inform members of the public that we had earlier on in the day informed and confirmed the news of the attack on the Gashish district of Barkin Ladi and confirmed the death toll to be 11 persons. “I was waiting for a report from the Assistant Commissioner of Police (Operations) who was sent by the Commissioner of Police to carry out a search and rescue operation in the district. Tyopev explained that the initial death figure given by the police was not to deceive the public but to give the true position of what they had as at that time. As apprehension mounts across the state, particularly LGAs sharing borders with Barkin Ladi, the state government imposed a dusk-to dawn-curfew in the affected local government as well as Riyom and Jos South LGAs. The Secretary to the State Government, Mr Rufus Bature, explained in a statement on Sunday that the curfew was imposed to avert any spillover and reprisal, as well as curb the escalation of the crisis. Meanwhile, the state governor, Simon Lalong, had to cut short his attendance of the National Convention of All Progressives Congress (APC) in Abuja as he returned to the state before the exercise was concluded. Visiting the affected communities, Governor Lalong appealed to people to remain calm and respect the curfew as the government investigates the immediate and remote causes of the attack.